2. How Deep is the Ocean? 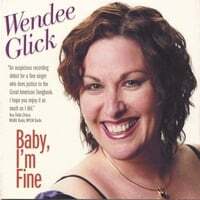 An experienced jazz vocalist, Wendee Glick is a singer with a strong stage presence, sense of humor, and ability to belt out a tune, even over a full big band orchestra. She can also sing a ballad with a “bell-like” quality that could make a person cry. She has graced the stages of many a New England jazz club, and large venues such as Boston’s Fleet Center and Hatch Shell, performing with top-notch musicians. Legally named Wendy Dee, Wendee’s interest in music began at a young age, because her own mother was a singer. Wendee toured Europe with America’s Youth in Concert and went on to study music at the University of Lowell. Classically trained, she started performing musical theater and opera but soon came to love jazz, influenced by jazz legends such as Ella Fitzgerald, Sarah Vaughn, Anita O’Day, and June Christy. Wendee has developed a substantial following in the New England area. She is equally at home singing with a small jazz group, or swinging with the Compaq Big Band. Annually, on The Jazz Cruise, she has jammed with and received praise from esteemed musicians such as Red Holloway, Eddie Higgins, Shelly Berg, Keter Betts, Nat Reeves, Chris Foreman, Duffy Jackson, Meredith d’Ambrosio and Wycliffe Gordon.